The Event Planner Expo is New York City's #1 trade show for the events and hospitality industry. This unique event will be held on October 2-3, 2018 at The Metropolitan Pavilion in Manhattan. The Event Planner Expo 2018 will feature over 150+ exhibiting venues and event services, 2,500+ event planning professionals in attendance, an educational, inspirational speaker series, and countless networking opportunities. Each year, The Event Planner Expo gets bigger and better and this year is no exception. For the first time ever, The Event Planner Expo will be a 2 day event and we will be introducing more new, exciting features. 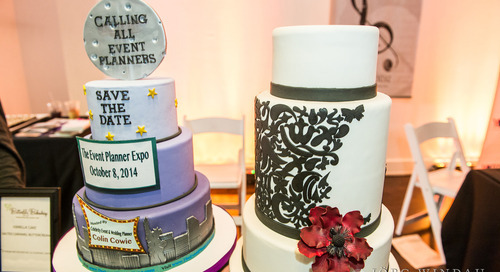 The Event Planner Expo is your one stop shop to cover every step of your event planning process. Browse over 150 booths representing top venues and event services in the New York City area and beyond including ballrooms, event spaces, hotels, florists, caterers, entertainment, A/V, event production, decor, restaurants, desserts, event technology, and more. Make connections with these excellent vendors and see how you can take your future events to the next level. Take this opportunity to network with thousands of elite event planning professionals. The expo is attended by over 2,500 event & meeting planners, marketing and PR professionals, corporate decision makers, wedding planners, business owners, and more. Forming relationships with these key professionals can greatly impact your business. The Event Planner Expo gives you tons of opportunities to do just that. Network in the main lounge, VIP networking lounge, after party and all throughout the expo and make hundreds of new connections. Discover ways to transform your events or hospitality business during The Event Planner Expo's Speaker Series. This is your opportunity to learn from successful industry leaders. Speakers will cover topics ranging from event trends to building a brand to expanding your business and much more. Past speakers include Martha Stewart, Colin Cowie, Randi Zuckerberg, Alexandra Wilkis Wilson, Paul Neuman, and Lauren Kay. Stay tuned for a special announcement about this year's speaker line up! Looking for a way to increase sales and take your business to the next level? Exhibit or sponsor at The Event Planner Expo 2018! Use this platform to get your events business in front of more than 2,500+ highly qualified event planning professionals. As an exhibitor at The Event Planner Expo you will have the chance to gain exposure to a key demographic of event planners, build your contact list, network with top industry professionals, increase sales, and much more. We have excellent opportunities available for those interested in becoming a sponsor or exhibitor at The Event Planner Expo 2018, but they wont last long! Contact us today to make sure you are a part of this amazing event! NY Drawing Booth provides events with rapid fast hand-drawn portraits-on iPads!